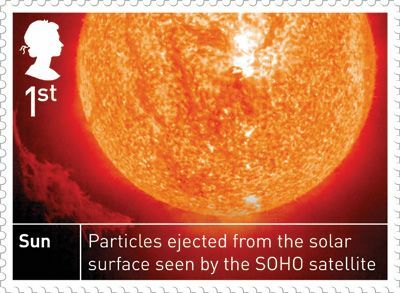 Aren't they beautiful, the Space Science stamps that were issued this week? 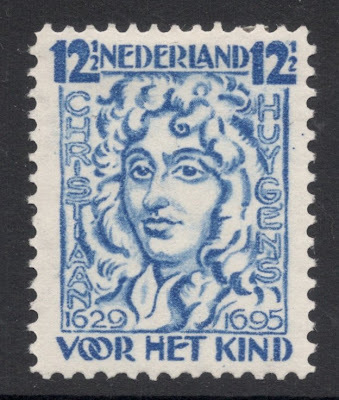 What a relief to have stamps with such remarkable images! There is something magical about the colourful beauty of space, especially because it's a world you don't normally get to see for yourself. If you look up at the sky, you normally only see a dark dome with silvery stars. Another great thing is that there is a complete world behind these images. A world of science, exploration, history and natural magic. For us stamp collectors this means an ideal set to expand on, to build a thematic collection around, to research our catalogues, which are just as magical and colourful. My two favourite stamps from the set are the ones depicting Venus and Titan, probably because they are similar in design, which makes them work well together. 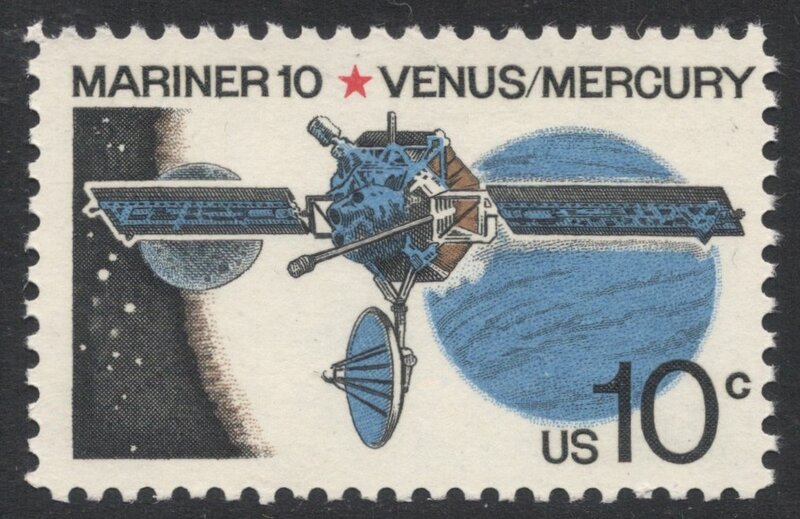 I had a little browse through my albums and found another Venus stamp, issued in 1975 by the United States. It shows the Mariner 10, a robotic space probe which was sent to Mercury and Venus to investigate both planets. This unmanned spacecraft was the first to clearly prove the existence of the extensive cloud cover of the planet. 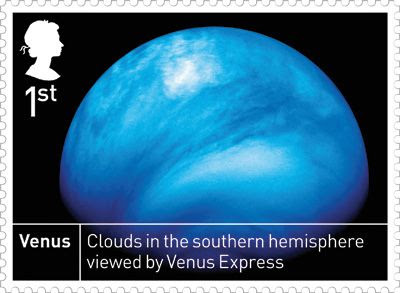 This cloud cover is also the main theme of the newly issued British stamp. Venus is also known for the so-called 'Transit of Venus', an event whereby Venus passses in front of the sun. 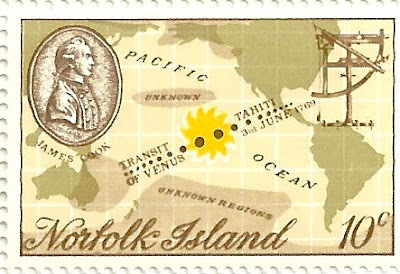 James Cook was among a couple of explorers who set out to record this transit, and that feat is remembered on a Norfolk Island stamp of 1969. You're too late to start looking out for this magical event, though, for it was in June of this year that this century's final Transit of Venus took place. From blue to green we go to Titan, the largest moon of Saturn. 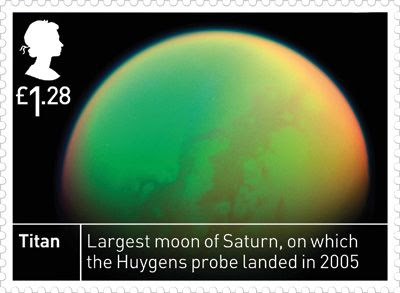 The Huygens probe mentioned on the stamp is named after Christiaan Huygens, the Dutchman who discovered Titan in 1655. 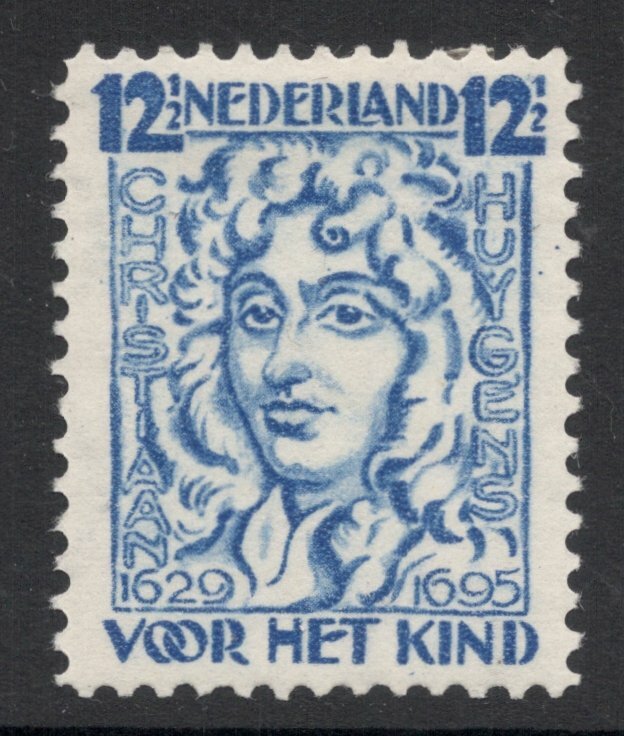 For that he is of course honoured on Dutch stamps, such as this one from 1928. That, however, is only a child welfare issue with various 'celebrities' included. 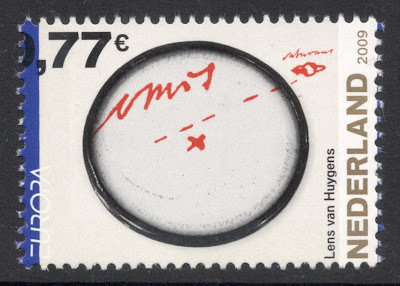 Huygens got more specific recognition on the 2009 Europa issue, based on the theme of astronomy. On this particular stamp we see Huygens' lens through which he actually discovered the first of Saturn's moons. It's hard to see on a scan (as it is on the stamp itself), but just inside the ring of the lens you should find a quote by the Roman poet Ovid: Admovere oculis distnatia sidera nostris, which means something like 'they (being they who study stars) have brought those faraway stars closer to us'. You should also be able to find the date February 3, 1655, which is the date of the final polishing of the lens. These two are not just design gimmicks, you'll actually find them on the lens itself, as you can see here. 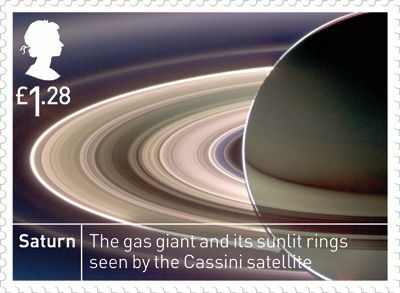 Saturn itself, in the meantime, is of course known for those wonderful icy rings around it, which have been captured on this stamp by yet another satellite. A beautiful image. So there you have it, I only spent one morning on the subject and have already unearthed some great gems! One of those rare times when I can say that RM got it right. I do like these stamps but I am a child of the 60s and was brought up on the "Race into Space"!